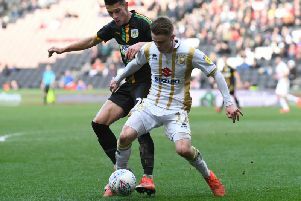 Like his counterpart in the opposing dugout, Crawley Town manager Gabriele Cioffi felt his side deserved something from the game at Stadium MK. Kieran Agard's 41st minute strike earned Dons their fourth consecutive win to keep them in the hunt for automatic promotion. And while Crawley remain 18th in League 2, wins for Cambridge and Yeovil move them within touching distance. "It was a good performance and the only thing missing was a goal or two from us," said Crawley boss Cioffi. "Milton Keynes are a good side but we restricted them to very few clear chances. We had good opportunities and should have taken at least one of them. "It is frustrating at the moment. We create the chances but we need to finish more of them off. At the other end I think we looked solid, but the goal is disappointing because it should have been avoided. Then Reece (Grego-Cox) is through in the second half and we get a free kick in our half which is a big surprise! "But the spirit is good. The boys have to keep believing in what we are trying to do as a squad. We have another opportunity next Saturday against Grimsby and we will train hard this week for the game."